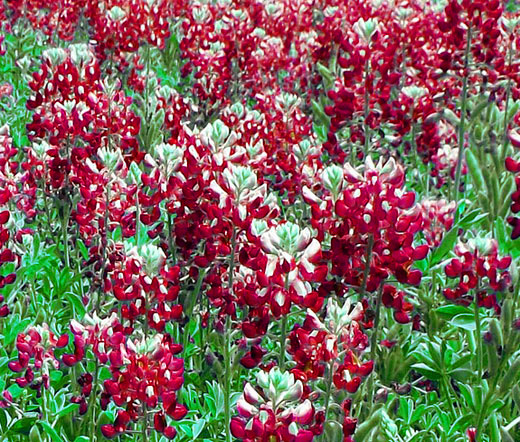 Maroon Bluebonnet Alamo Fire Lupinus Texensis is a beautiful annual wildflower. Maroon Bluebonnet bulk seeds are an affordable way to establish the plant if the large area has to be covered. The seeds are easy to germinate, and they may germinate faster after soaking in tepid water for 12 to 24 hours prior sowing. The germination takes approximately 20 days, and Maroon Bluebonnet begins blooming approximately three months later. Lupinus Texensis is a selection of the native bluebonnet carefully selected for its outstanding color, and Maroon Bluebonnet features light-green foliage with velvety, palmately compound leaves that are born from branching, 6-18 inches stems. Maroon Bluebonnet blooms with clusters of up to 50 fragrant, red-maroon, pea-like flowers, and the tips of the clusters are conspicuously white. Maroon Bluebonnet Alamo Fire is a rare variety that looks outstanding in mass planting, containers, hanging baskets, roadside and hillside planting, meadows. Lupinus Texensis seeds produce a very showy, drought tolerant annual wildflower that has larger, more sharply pointed leaves and more numerous flower heads than similar lupines. If cross-pollination occurs, the next generation of seed from the Maroon Bluebonnets may contain some purple or blue flowers within the population. In order to keep the Maroon Bluebonnets true to color (maroon), any plants that bloom in shades of purple or blue should be removed from the site as soon as the buds open to avoid cross-pollination.